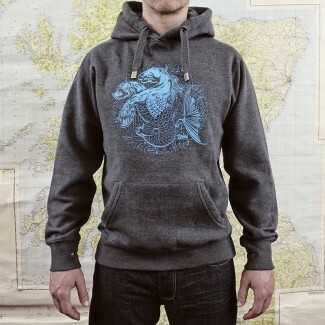 Our signature design comes from folklore and mythical tales of a water horse in Celtic tradition Kelpie, or water Kelpie, is the Scots name given to a shape-shifting water spirit inhabiting the lochs and pools of Scotland. Our Hoods have a great reputation for long lasting quality, comfortable soft, great shape detail and feel, constructed of 100% Combed Cotton. 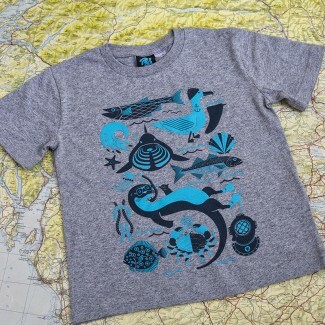 Sealife, all the wonderful elements that make up a great sealife adventure on a Tee. 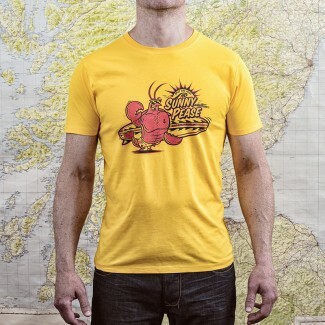 Our T-Shirts have a great reputation for long lasting quality, comfortable soft, great shape detail and feel, constructed of 100% Eco Friendly Combed Cotton. 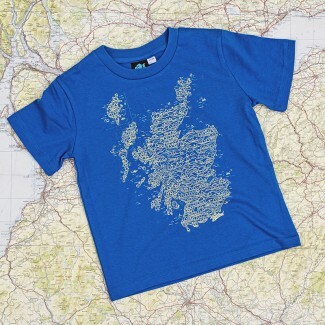 The ‘Scottish Wired’ design reflects the diversity of Scottish life in modern graphic components. Graphical patterned trees and hills frame the images of the castles and lochs and echoes the simplicity of the scene. The ‘mash-up’ of traditional and edgy, graphic elements of the Staunch Industries print, mirror the traditional and contemporary aspects of our design roots. Our shirts are comfortable and soft, great shape detail and feel, constructed of 100% Combed Cotton. Screen printed with our own original artwork, youthful, fun, flattering perfect for layering up or as a stand-alone piece. 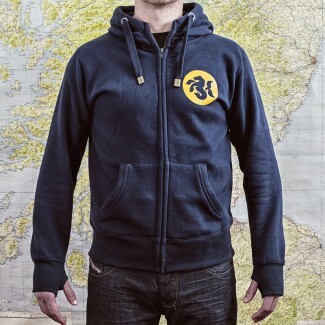 Coming as the perfect solution to taking the chill of a summer evening, A classic everyday hoodie from the Staunch studio with a dark navy base colour and contrasting, mustard yellow design on the back. 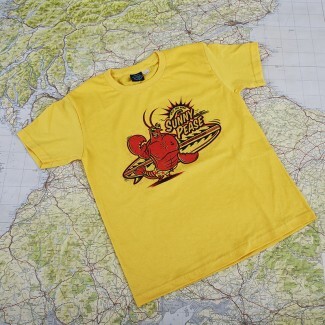 As a hot new season piece Sunny Pease, home of the caravan and sweet wee break...comes in a sunny golden squash colourway. Pease Bay is an award-winning beachfront with a surf break of the beach and reef. Its our local spot and your's too 15% of the sale of this shirt goes to support the Wave Project for the great work they do. Heads up! step up your style with one of these bespoke designed snapback trucker caps. 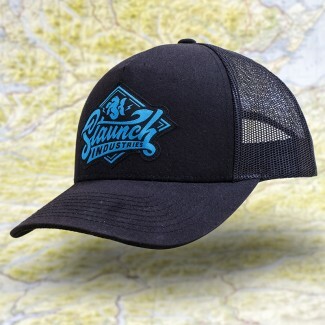 This cap will put the finishing touches on any of your outdoor outfits while keeping the sun out of your eyes. Our designed cap’s aim to keep you looking fresh all year round, what ever the weather situation. 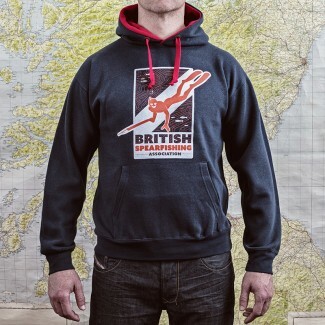 British Spearfishing Association - Official Apparel, for all you diving nuts out there across the blue marble stand united in working together to keep the oceans healthy. Our Hoods have a great reputation for long lasting quality, comfortable soft, great shape detail and feel, constructed of 100% Eco Friendly Combed Cotton. 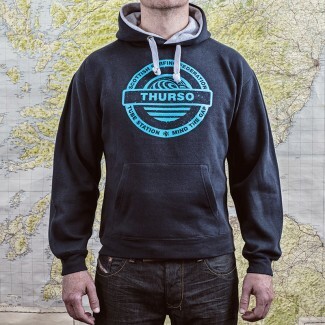 MIND THE GAP.... Scottish Surfing Federation Thurso Tube station, you have been seen and conquered the beast now wear this hood with pride. 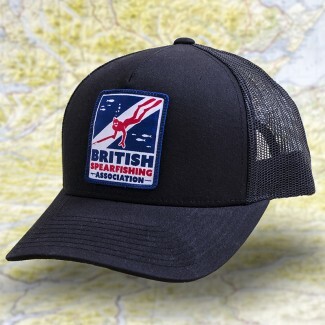 Represent and be part of the British Spearfishing Association team.. with one of these snapback trucker caps.